Part of me is Italian – not metaphorically – I am actually a quarter Italian. My maternal great grandparents settled in Scotland in the early 1900’s. I am embarrassed to admit that I have never been to Italy – but this is something that my partner (from now on in to be referred to as Disneyboi) and I plan to rectify for our tenth anniversary next year. Anyhoo, I got the urge to bake my roots so to speak and thought I would whip up a batch of biscotti. Biscotti are very low in fat and the first thing I grab in Starbucks when I fancy a snack. Biscotti actually translates as 'twice baked' which is the method for baking this deliciousness. What with all this baking, my waistline was crying out for a low-fat treat, so biscotti it was. And I love the flavour of chocolate and hazelnut together –the Italians call this Gianduja. Who doesn’t love Nutella?? Line a baking sheet with greaseproof paper and pre-heat your oven to 150oC. In a dry frying pan, on medium heat toast the nuts. They are done when you can smell them. Take them off the heat and set aside to cool. In a bowl mix together the flour, cocoa powder, bicarb, salt, coffee and chocolate chips. In a separate bowl whisk together the eggs, egg whites, sugar and vanilla. Now add the flour mix to the egg mix and stir well. Add the nuts and stir through. The dough will look quite wet and sticky – this is normal. Dividing the dough into two, make two low flat loaves on the baking sheet, about 8 inches long and 3-4 inches wide. Leave space between the two as they spread a little. Pop into the oven for 35 minutes. After this time the loaves should be firm to touch but give a little when pressed. Leave to cool for half an hour. Leave the oven on at the same temperature. Carefully peel from the baking paper and on a chopping board with a sharp bread knife, cut the loaves into slices – about ¾ inch thick. Place back on to the, now unlined, baking sheet standing up. Pop back into the oven for 25 minutes, rotating halfway through. Remove from the oven and leave to cool completely. 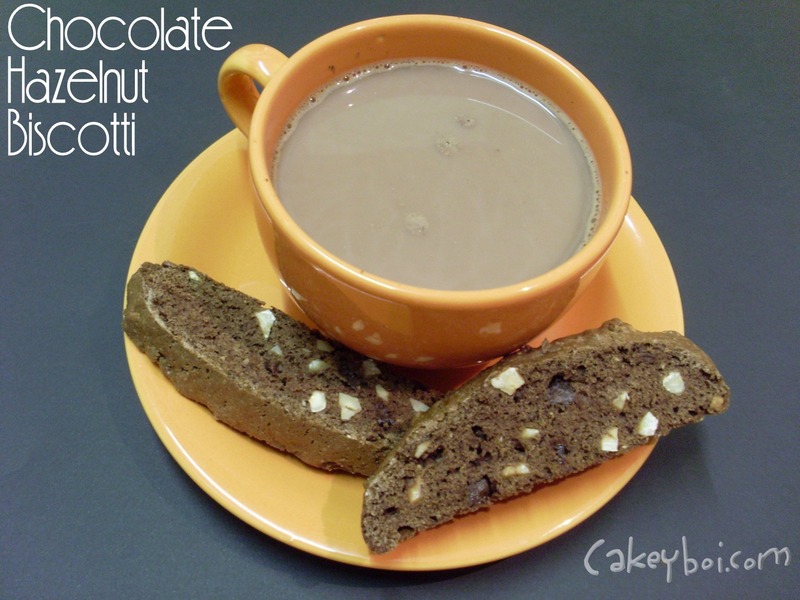 The biscotti are very hard and crunchy- perfect to dunk into hot coffee or chocolate. The chocolate chips add a nice hit of sweetness, whilst the hazelnuts provide crunch. Tip: Use Starbucks Via sachets for the coffee powder to give a more powerful coffee tang. Cheers Janice - just had some tonight with coffee - yummy!